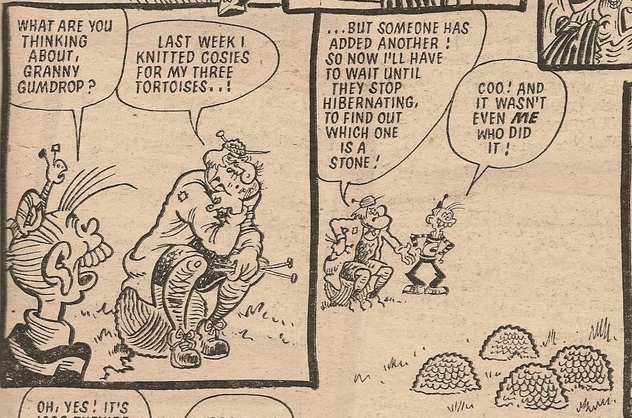 Mr Codface never returned to the pages of Krazy, but a remarkably similar-looking purveyor of piscatorial provender made his (anonymous) debut in Cheeky Weekly's second issue dated 29 October 1977.. 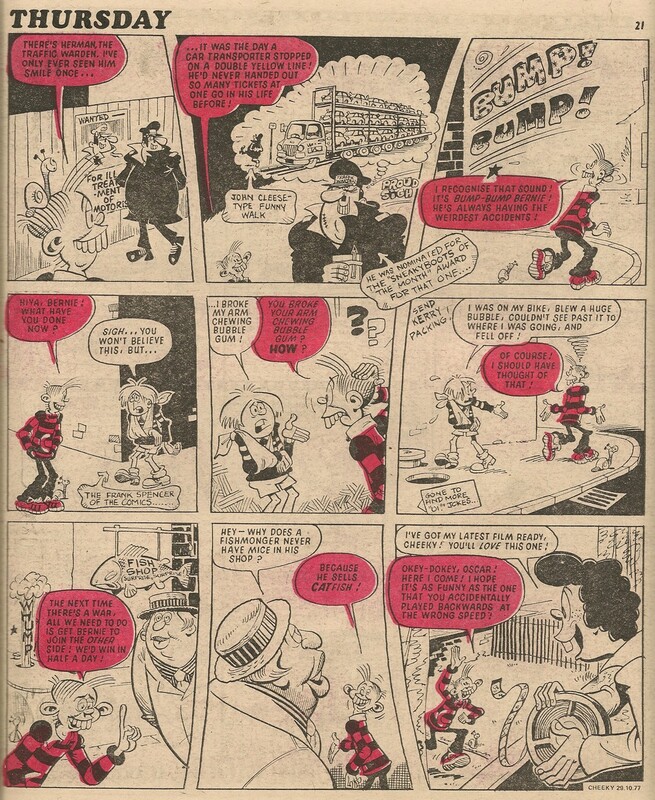 There were no further fishmonger funnies in Cheeky Weekly until 39 weeks later in the 29 July 1978 edition, in which Cheeky addressed the seafood salesman as Mr Haddock. 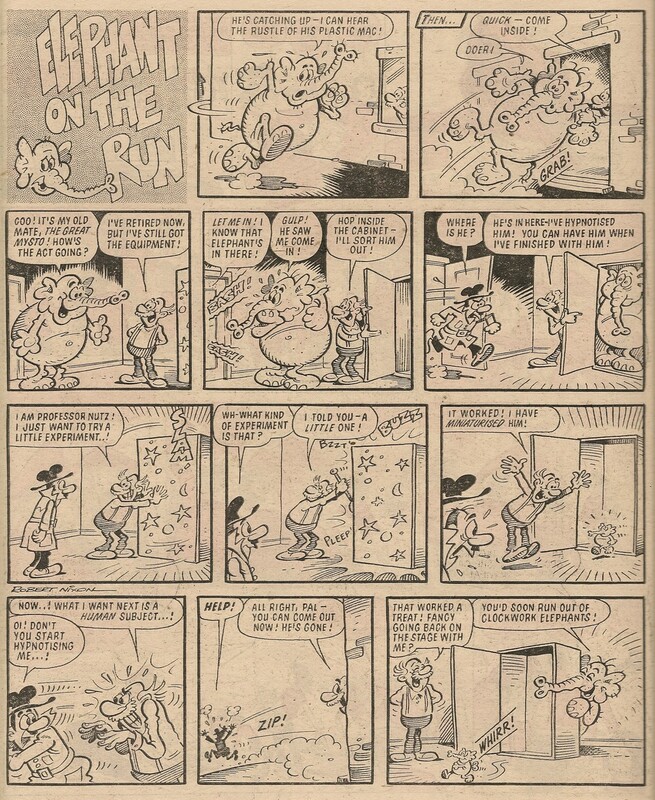 Haddock appeared twice in the 10 February 1979 comic; once on Tuesday, and again in The Burpo Special, which was that week devoted to Auntie Daisy. 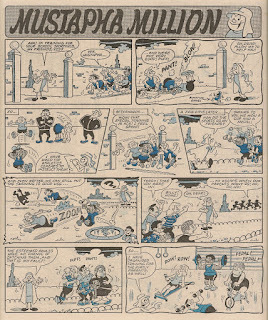 Mr Haddock's single cover appearance occurred on the front of the 03 March 1979 edition. 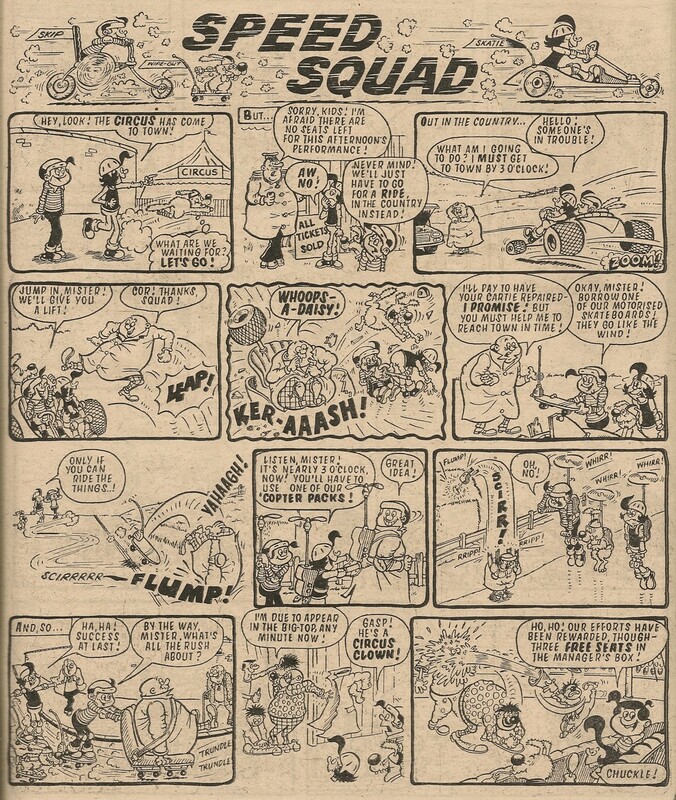 There was another double helping of seafood silliness in the comic dated 11 August 1979, as on Sunday Cheeky encountered Gloomy Glad who was less than impressed with Mr Haddock's expanding business empire, while the shellfish shopkeeper was back on Friday for his usual finny fun. 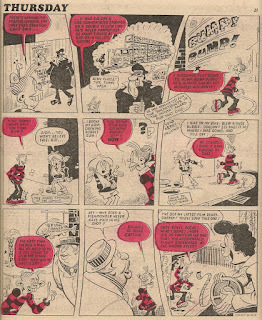 Haddock's final Cheeky Weekly appearance was in the comic dated 26 January 1980, bringing the total number of issues he appeared in to a fishtastic 43. Surprsingly, the character was most regularly seen on Tuesday, not Friday. Saturday then returned to page 26, but the following issue saw an ad for Woodcraft Village, a venture into the toy market by safety match manufacturers Bryant & May, occupy the subject location. 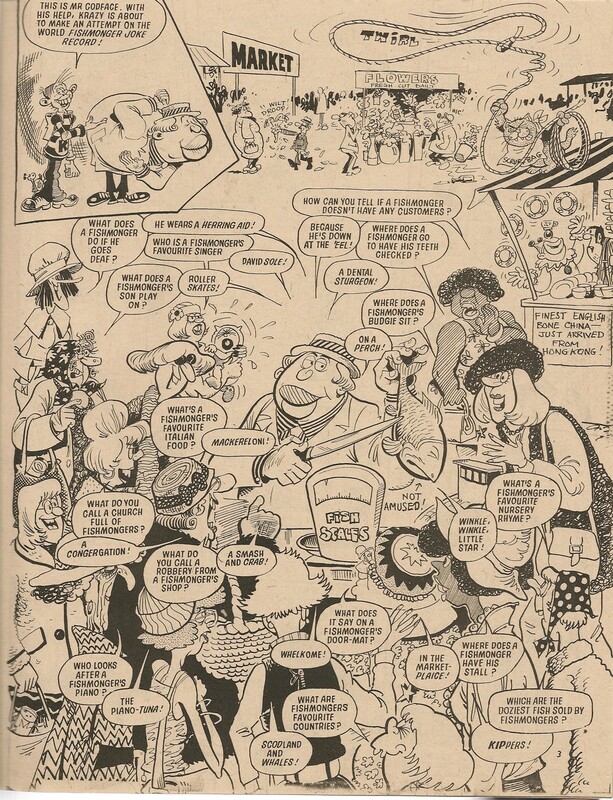 In the 24 June 1978 edition, Saturday resumed occupation of page 26, beginning a 3-week run, ended in the 22 July 1978 issue by a page advertising two of IPC's 1978 Specials - The Cheeky Summer Special and Whoopee Holiday Special. A week later page 26 hosted an ad placed by Birds Eye who were running a cunning promotion whereby consumers of their tubs of Mousse were invited to send in 8 lids and receive a 'Mousse Shoot', which was a device designed to fire those very same lids 'high into the sky'. 2 lids were supplied with the Mousse Shoot, but kids applying for the offer were thus 6 lids down on the deal. If the launcher was as powerful as the ad suggests, the lids supplied would soon be lost, requiring the consumption of more Mousse in order to provide replacement ammo for the device. 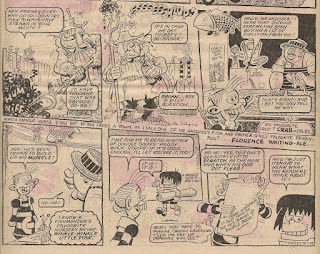 A week later Tweety and Sylvester began what was to be a 7-week run on page 26, but in the following edition Hickory Dickory Doc, a reprinted one-off strip from Cor! !, was for some reason employed to represent the cartoon segment of Saturday's picture show. In a surprise move, the 02 December 1978 issue saw the final episode of The Terrible Trail to Taggart's Treasure come to rest in the site under review, but a week later Saturday made its final appearance on page 26, bringing to 16 the number of times it occupied that spot, making Saturday the third most frequent feature to occupy that location. After its 3 week absence, Cheeky Weekly returned with the issue cover dated 06 January 1979, in which the first episode of Eagle Eye (another reprint, this time sourced from Shiver and Shake) fetched up on page 26. Eagle Eye was in fact lucky enough to remain in the same location for the entirety of its 8-week run. 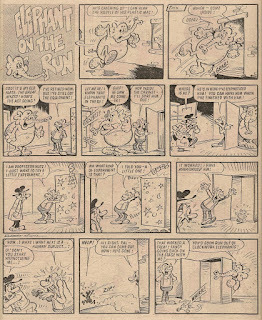 In the edition following the conclusion of Eagle Eye, another reprinted adventure strip, again retrieved from the Shiver and Shake archives, commenced on page 26. This time it was Menace of The Alpha Man. 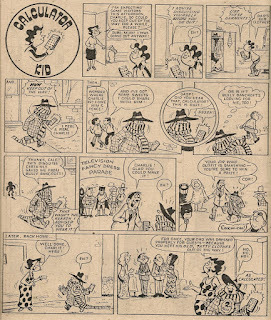 The titular letter-obsessed felon was, like Eagle Eye, given the honour of remaining in the same location for the whole of his nefarious escapade, making his strip the second most regular page 26 occupant, numbering 18 issues. Cheeky Weekly's affluent stalwart Mustapha Million made his single visit to page 26 in the following 'new look' issue dated 07 July 1979, after which the father and son feuding of Why, Dad,Why? made a similarly unique sojourn in the same location. 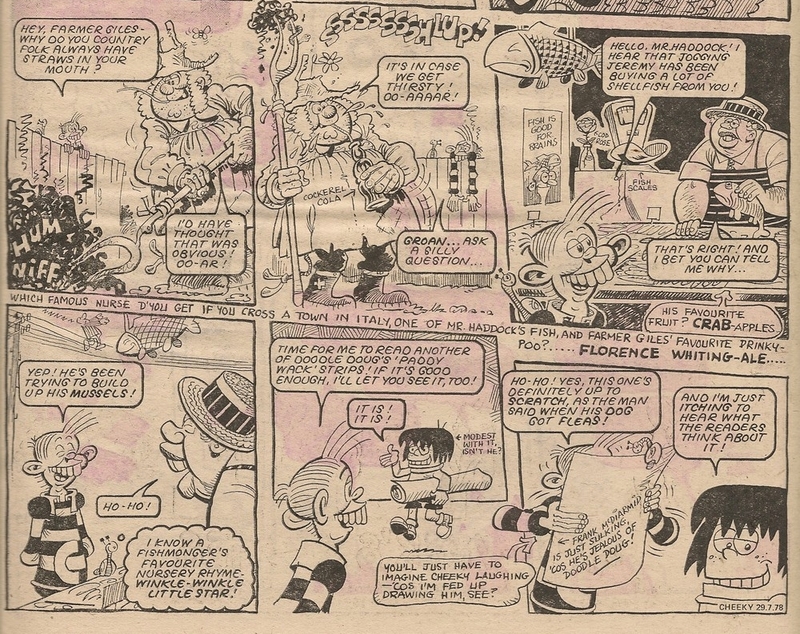 In the comic dated 21 July 1979 Cheeky's Friday antics were related on page 26, as they were in the ensuing 9 editions. Mystery Boy then moved in for a single week, after which Friday returned for 2 issues. Disaster Des then unleashed his customary mayhem in the subject location (the only time he appeared on page 26), and Friday then moved back for 2 weeks. 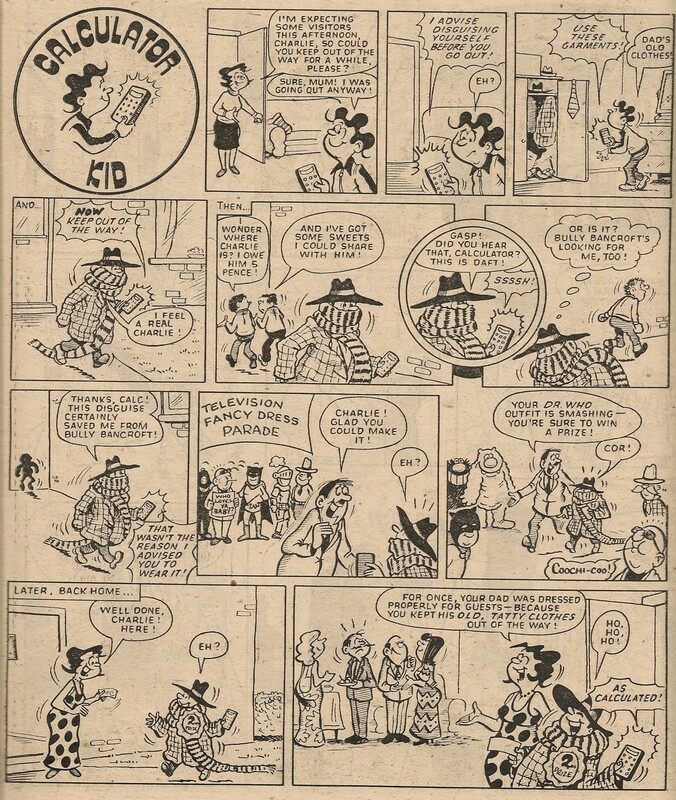 The 03 November 1979 comic saw another feature make a single page 26 appearance; this time it was Thursday. The following week Friday returned for what was to be a 10-week residency, after which it was the turn of reader-participation-gagfest Joke-Box Jury to occupy the subject location for a single time. Friday then returned to page 26 for Cheeky Weekly's final 2 issues, bringing the total number of times it appeared there to 25 and making it the most regularly-featured occupant of the site under review. If you're getting a sensation of deja chuckle from this cover it's because the visuals are constructed from previously-published artwork. 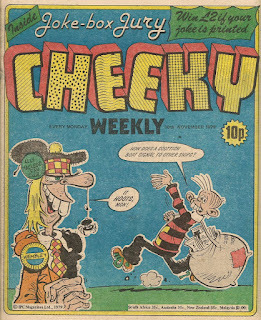 The image of Uncle Hamish originally appeared in Cheeky Weekly dated 21 July 1979, and the drawing of a newspaper-delivery-bag-toting Cheeky is sourced from the cover of the 07 July 1979 edition. Cheeky's Week proper starts over the page with a Sunday rendered by Barrie Appleby, following which we get to see what Batman looks like when drawn by Terry Bave (and which of us hasn't pondered that at some time or other?). It's very rare to find oneself disappointed by Terry Bave's artwork, but I must admit I feel we've been a bit short-changed as regards the TV-related fancy dress costumes on display above. 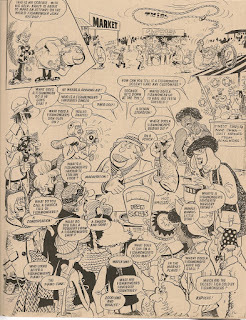 Apart from the caped crusader and Kojak (and Charlie's inadvertent Doctor), there are no other identifiable characters on view, unless those are two Monster Muncheers in panel 3, row 3. I would have expected a dustbin-based Dalek at the very least. This week's 6 Million Dollar Gran story is her final 3-pager. Elephant on The Run recognises an old friend this week but it would seem that our amnesiac pachyderm pal doesn't appreciate the significance of this recovered memory and so fails to question The Great Mysto about who he is and how he came to be in his current peripatetic predicament. Barrie Appleby draws Cheeky's Week up to and including Wednesday, after which Bob Hill takes up the pen to furnish the remainder of our grinning pal's seven day gagfest. 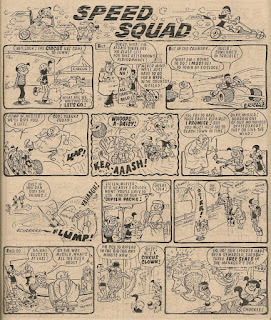 This was the only time that Bob drew Cheeky's Week (though his association with the toothy funster goes back to the 10 September 1977 issue of Krazy wherein he took over the artwork on The Krazy Gang from Ian Knox), and Barrie's work on this issue was the final time he contributed to the daily pages of Cheeky's Week, although his final Cheeky Weekly art was on the cover of the 17 November 1979 edition. Cheeky's Saturday is devoted to a visit to the newspaper offices courtesy of Rex Press. The big news is that a number of the toothy funster's pals are there and the jokes flow like newsprint off the presses. 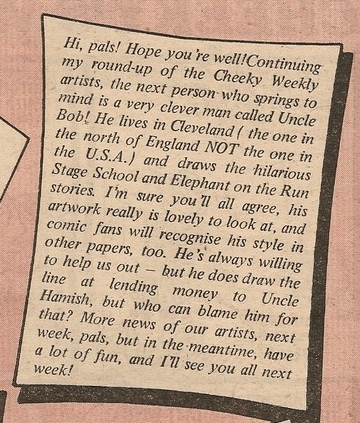 As mentioned above, Bob Hill and Barrie Appleby share the Cheeky's Week artwork duties in this issue while Frank McDiarmid's recycled renderings grace the cover. 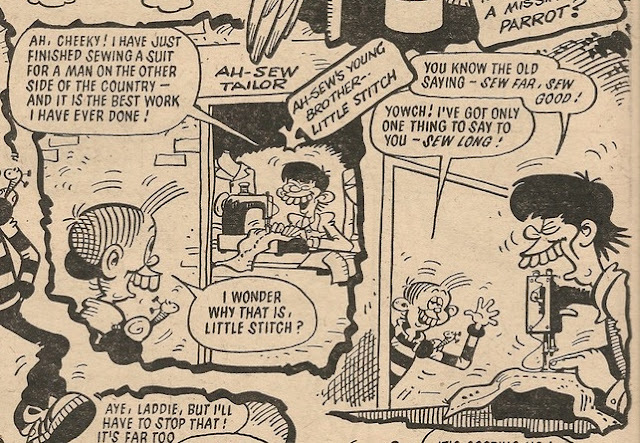 Ah Sew's younger brother Little Stitch made his one and only Cheeky Weekly appearance in the issue dated 01 December 1979. This one-off character's name was punningly based on that of the diminutive but large-booted music hall performer Little Tich (1867-1928). The joke assigned to Little Stitch could quite easily have been delivered by his older sibling, but the Cheeky's Week scriptwiter evidently felt that it was worth creating a new character just to wring out an extra gag from his name (though whether kids of the late 70's would have been aware of the music hall allusion is open to question).